I usually don’t post until I have something done – but as the weather gets better it seems projects are happening in the basement, first floor, upstairs and outside at the same time. In the living room I debated what light fixture to use in the center of the room. I had this 25″ stained glass lamp in my present home so I popped it in here to see how it would look. 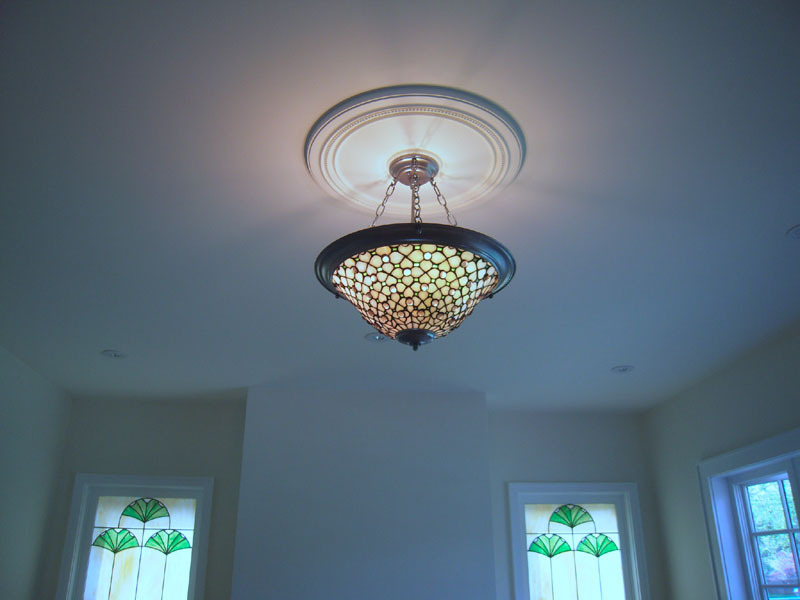 I also added a ceiling medallion that is the same diameter. 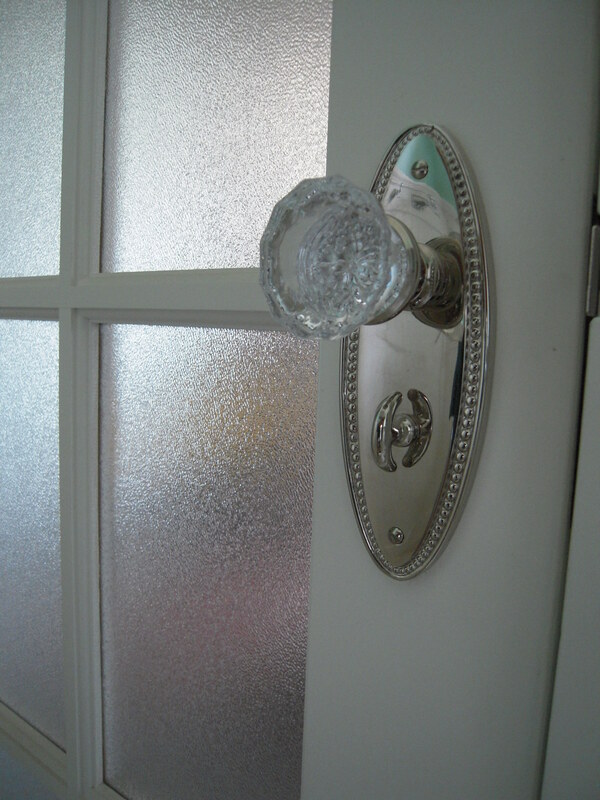 The bead design in the medallion matches the detail in the door plates. The fixture has white and green stained glass with clear cabochon jewels. I like the fact that the shape of the shade and colors mirror the ginkgo windows. I’ll put whiter LED bulbs in the fixture. I looks yellow because of the old tungsten bulbs. But not 100% sure. What do you think? Should I keep this or go with a traditional crystal chandelier? And the one rain free day (yesterday) the old roof was torn off. And the new roof went on. 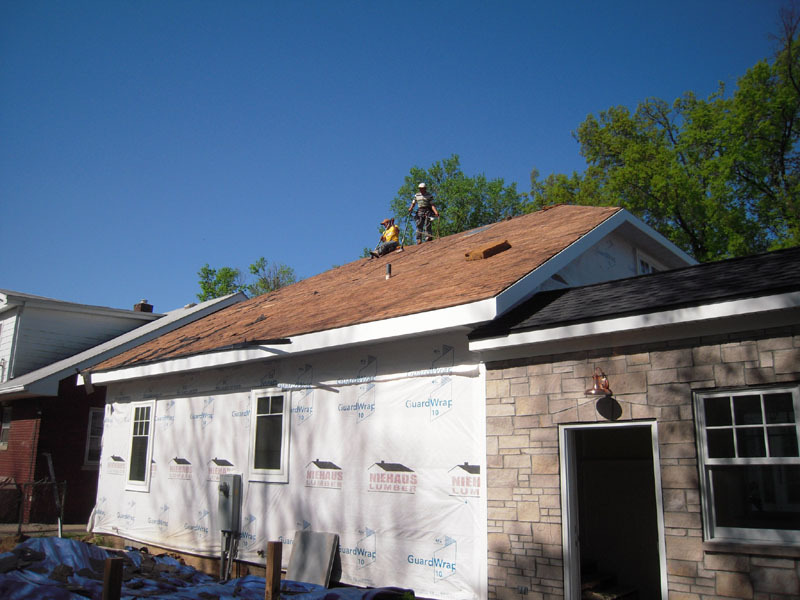 Finally the roof is on and I can start on the final details and siding outside. I have worked with a lot of contractors on this project. I do most of the work around here – but have sub contracted the plumbing and foundation work in the past – some with not too great results. 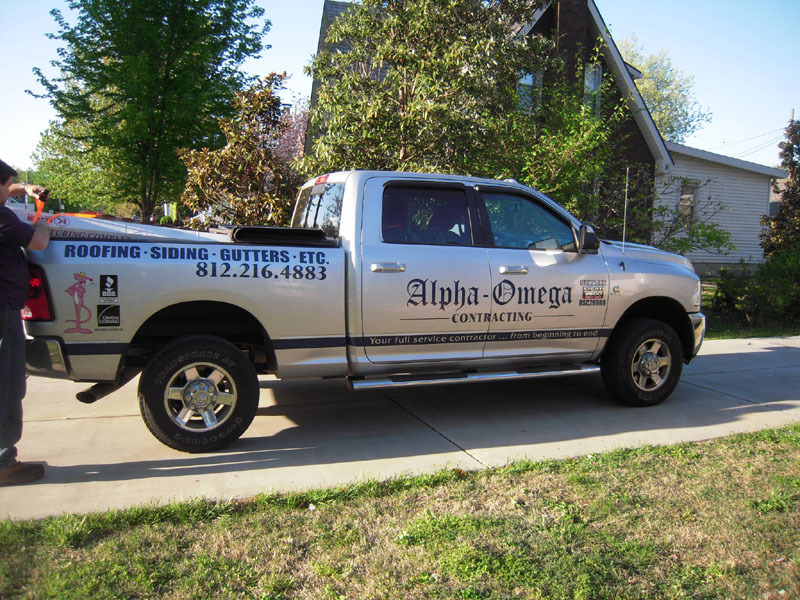 For the roofing for my home and the Gallery, I chose my friend Bill Combs with Alpha-Omega Contracting to do my roofs. I want to highly recommend him for any project. I think those that follow along will know how particular I am with everything dealing with this house, and Bill was even more demanding that every element was well done. I should know, as I was on the roof too. I can’t thank him enough for putting up with my specific demands of my special copper chimney flashings and my newly installed Azek trim shows barely a scratch. When the crew was done you couldn’t tell they were ever there. So a big A+ for Alpha-Omega Contracting. Lets hope the rest of this renovation goes as smoothly. 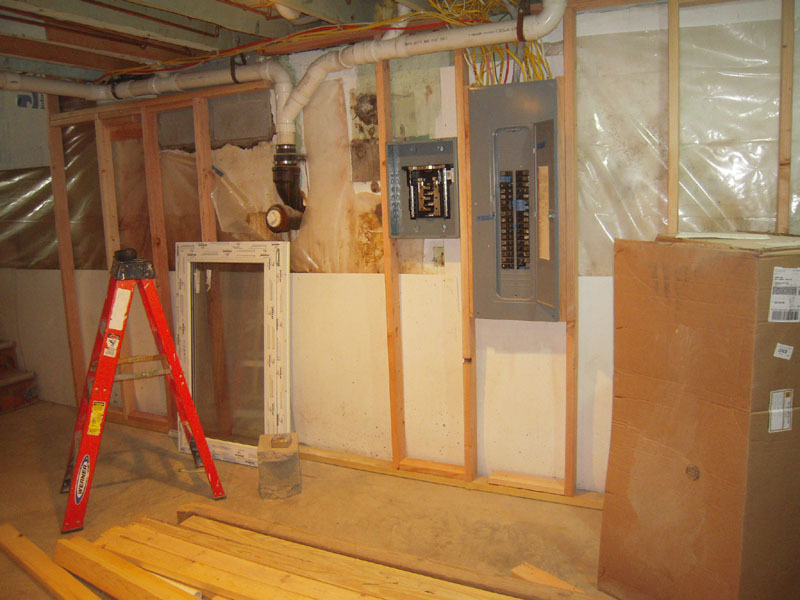 This entry was posted in Basement Renovation, Exterior Remodeling, Living Room and tagged 1930's bungalow, Alpha-Omega Contracting, Azek meter base, Electrical sub panel, Home Renovation, Old Home Renovation, Roofing by curt. Bookmark the permalink. loving the look of that light! Thanks, Melissa! I’ve decided to keep it – It’s funny I’ve looked at this light in my present home’s entryway for 11 years and never though of putting it in here – but the colors work. Thanks for your vote! The light looks fantastic – it picks up so many of the other details in the leadlight design and the door hardware. It’s great to see that the weather has been on your side to get all of the other jobs done! Thanks Matt – I’ve decided to keep the light. It rains every other day here – but I was able to remove two old basement windows and add new ones – so progress is slow but steady. I really like that stained glass light, too. I think it’s a better complement to the beautiful windows than a crystal fixture would be. Personally, I’m a fan of the warmer light that tungsten bulbs give, but since we switched to LEDs, I’ve learned to look for the 2700 Kelvin ones, which aren’t as bright white. They seem to look better in an old house. 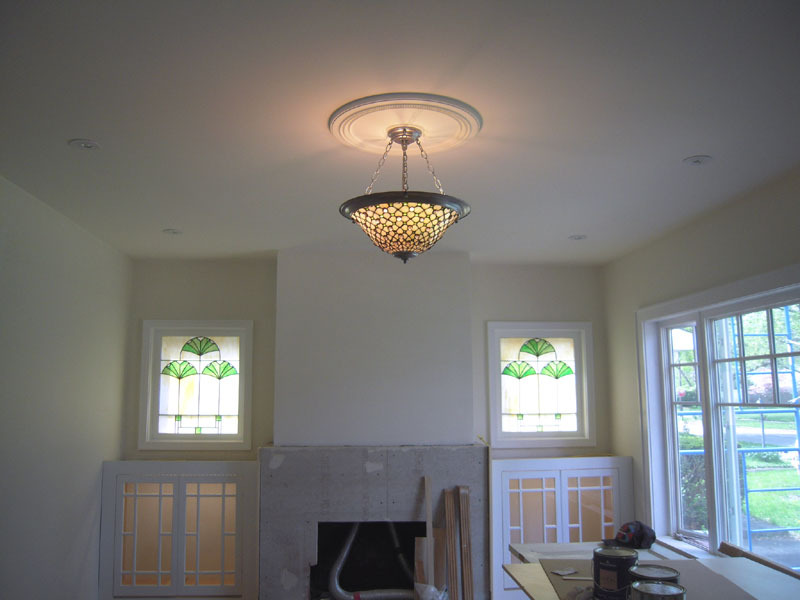 Thanks D’Arcy – I had a traditional chandelier in my mind when I was designing this – but I had this fixture in my entryway at home so I thought I would give it a try. I’ll keep this fixture and get the warmer led’s. Thanks! Thanks Jo – so many things to do…so little time. I like the look of the light – the yellow gives a warmer glow. yes, I agree…. that light fits so well with the style of those cupboards and your lovely stained glass panels. This space has a real 1920’s feel & one of my favourite periods before the overly geometric version of Art Deco took hold. What age is your house? I too love a crystal chandelier but there is no place for one at French house, sadly! It’s tough isn’t it when you have a great piece but nowhere to put it!!! Hi Gill! Thanks for the vote of the light. 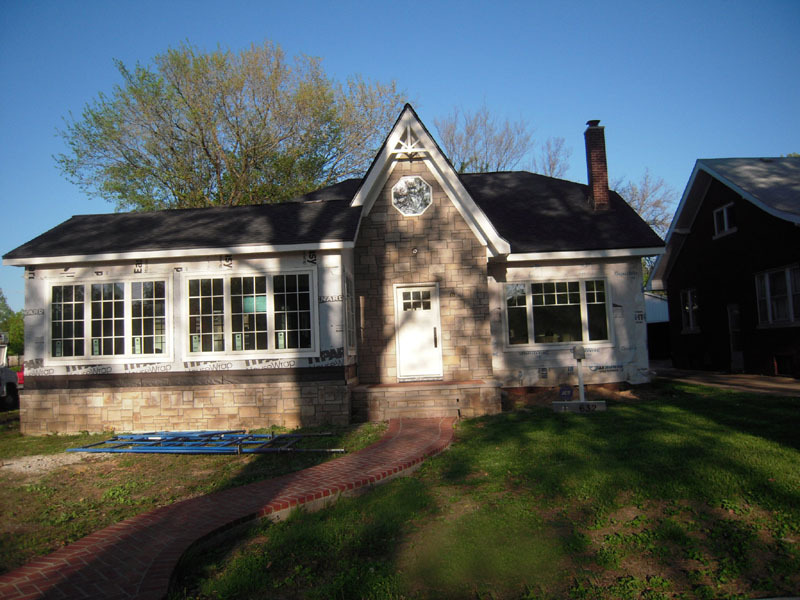 The house was built in 1935 – but it’s really a mix of styles. It wasn’t an expensive house when built – and no real design direction. But it does have a few period design gems I’m trying to exploit 🙂 I’m thinking I can get a chandelier in the upstairs bathroom – but we’ll see. Happy renovating. How about a low slung chandelier right by the tub so your wife can laze in there with a book and butler service (you of course1) I am working on just this scenario with Trevor! ( except I am having an antique metal lantern dangling down as my reading light! I think the light is perfect for the space and the style of the room. Definitely keep it! Absolutely!! Chandeliers in bathrooms are a no brainer! Make sure and do a post so I can live vicariously through you and your gorgeous house!! Thank you!